We trust you’ve been reading — and enjoying — senior staff writer Dan Lamothe’s numerous dispatches from Afghanistan, where he and photographer James Lee are embedded presently with members of 1st Battalion, 8th Marines, out of Camp Lejeune, N.C. Thanks so much for your continued interest in their work. Today, over on Marine Corps Times’ home page, we’ve rolled out Lamothe’s first hard-news report from this trip to the war zone. It details aggressive efforts to curtail the flow of stored poppy out of Afghanistan ahead of the spring harvest, now just weeks away. Before shipping out last week to 1/8’s area of operations in Kajaki, Lamothe spent several days at Camp Leatherneck, the Corps’ nerve center in southwestern Afghanistan. There, he met with Maj. Gen. David Berger, the head of 1st Marine Division (Forward), who provided a sitrep on Marines’ activities throughout Helmand province. A principal focus at the moment, Berger explained, is preventing old stocks of poppy from leaving the country. 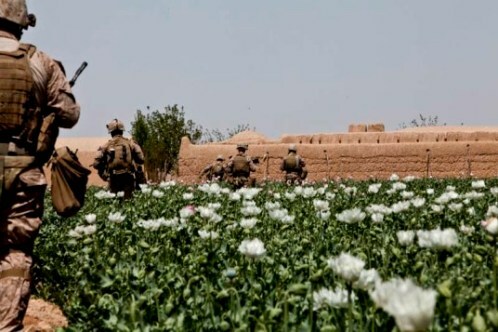 Poppy, of course, is used to make heroin and other narcotics, and its trade has long lined Taliban pockets. Marine battalions in central Helmand have actively fought to stifle mobile smuggling, Berger said. In Marjah district, 2nd Battalion, 9th Marines, out of Camp Lejeune, N.C., has had a standing request for helicopters and a heliborne raid force for more than a month. Earlier this month, Marines used drones to track vehicles after they left a mobile bazaar, Berger said. The smugglers eventually parked, hid their vehicles and walked nearly a mile away from them to get some sleep. A raid force with Lejeune’s 2nd Battalion, 6th Marines, reached the vehicles at first light and found about 3,000 pounds of cocaine, opium and heroin. Marines are not involved in any poppy eradication, for fear that doing so would alienate the local population, Berger said. The crops are fair game only after they’ve left the farmers’ hands. So now Marines are DEA agents? That’s funny, seems to me the reason there over there is to protect the opium crop so the USA pharmacutical companies can make there billions off of all the addicted Americans on Percocet and Vicoden. It’s about time they hoist up the anchor in the shithole, what a waste of lives and money!!!! One detail on the drugs found: cocaine comes from the coca plant in south America and not from opium.